Look out, folks! The title on this one is rather deceiving. I actually won a copy of this book on a fellow book lovers blog some time ago but just finally got around to it. I was intrigued, of course, by the concept of simplifying one's life both practically and spiritually and didn't really pay much attention to the authors or who they were at the time of my winning the contest. Of course, when I finally plucked the book down from the shelf I took note of the authors: Pam & Chuck D. Pierce. Or, to some, Pam Pierce and the Apostle Chuck who is president of Glory of Zion International Ministries. It is, as I was forewarned, divided into two sections. The first half of the book is written by Pam Pierce and she shares practical advice through story telling - explaining how she came to certain conclusions about how she needed to slow down various aspects of life. She talks about how she needed to let go of certain possessions and/or expectations in order that God could more easily move and use her according to His good pleasure. So far so good. There were a few question marks in my head as to her theology but I generally found her thoughts to be practical and was able to ignore that which I may disagree with. In the second half of the book, her husband, the Apostle Chuck (I'm sorry. I just cannot resist.) speaks to the issue of anxiety which sometimes relates to the idea of simplicity and sometimes does not. I agree with my friend the other book blogger in saying that this section of the book felt disjointed from the first. I think he's trying to discuss how owning and possessing things, believing ourselves to be in control of our life and situations, can cause anxiety. If I am going to connect the dots on his behalf, then I would say he is trying to cause the reader to understand that anxiety about "stuff" and life circumstances gets in the way of trying to live simply and therefore you should try to deal with any anxiety you might have. At least, that's what he should be saying if he wanted to connect the dots. I'm not totally sure that he does. It's rather hard to say. If his wife is trying to discuss how readers can lead productive, simple lives, focusing priorities on what God would have them do, then her husband kind of steps in and ruins the book for her. His message does not really make sense or line up very well with the ideas that she is trying to communicate and it feels like he is on a tangent wanting to share about his gift of prophesy and some individual lessons he believes God would have him share that are rather completely unrelated to the message of simplicity. It's like he got all hyped up about the idea of his wife being published that he couldn't contain himself and had to put his hand in the cookie pot. Too many hands in the pot in this case! I thought about stopping the read at page 118 and ignoring the remaining 76 pages of rambling by her husband but the deepest morbid curiosity drove me onward. I couldn't not look at the Glory of Zion International Ministries website. I couldn't not watch the videos they provide with from recent services. I couldn't help but think about the church from which we came not so very long ago that was traveling on a path that was going to take them right to the Glory of Zion. And I became more firm in my belief that wisdom, knowledge of scripture, and spiritual discernment are essential parts of the Christian walk. (See also Think.) I have a serious problem with the Apostle Chuck and for me, he pretty much ruined whatever could be gleaned, on the whole, from this book. For one thing, I recognized the lingo and "dialect", if you will, that he was using when talking about what God "wants" for us in our lifetime. (Think peace, health, wealth, and a limo at your beck and call, etc.) There is a rather remarkable lack of devotion to truth and instead it is replaced with words like "respect", "honor", "value" and "love." I don't know if you've noticed, but trying to speak with someone who can only respond with, "Well, we just have to love each other" can get you nowhere in your conversation in a great big hurry. That's the fast-track statement to a completely unprofitable interaction. If speaking of someone's personal preference relating to their favorite flavor of ice cream, then we should just learn to love each other, yes. If we're talking about matters of doctrine, it requires a closer examination of a set of beliefs and putting such beliefs under the proverbial microscope. We are supposed to test everything in the light of scriptures (Acts 17:10-12; 2 Tim. 3:16-17). We are to cling to what is good (and reject what is evil.) Without a firm foundation, the building will crumble. Just like this book. 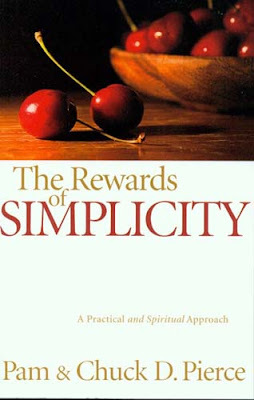 The Apostle Chuck manhandles The Rewards of Simplicity in such a way as to totally distract the reader from the title and the supposed purpose of it. Instead he lapses into his emotional life experiences and starts talking about spiritual strongholds and prophesies which have been revealed to him and that he has revealed to others. He even mentions that he was prophesying that the American Church would be going to war on September 18, 2001. He points to September 11th and without using words (because he really dare not) suggests that his prophet-hood is right on target. But I'm pretty sure that when God gives a message, He is always accurate and if someone's prophesies fail to come to pass, then you cannot and should not be taking them seriously. (Deut. 18:22; Galations 1:8-9) Actually, men who claimed to be prophets in the Old Testament but who failed to deliver true messages were condemned to die. (Jeremiah 28:1-17; Jer. 29:24-32) It's kind of a big deal if you claim to be a Prophet of God and yet the prophesies coming forth from your mouth are not true. (We're not talking about making a guess as to when Apple will release the next version of the iPod here.) Again, even the much heralded Church of Acts that modern day Christians are anxious to return to (minus the intense persecution, of course!) searched the scriptures to see if what was being taught to them was actual truth. If they found untruth in the message, I doubt that they would have paid much credence to it or would have said anything like, "Well, why don't we just all try to get along." Instead they would have demanded the truth. Not so with this "Glory" doctrine which would set scriptures aside if someone has a dream to share, or a vision to expound on, or who might have received a visitation in some form or fashion that is questionable at best and mostly lacks credible evidence which can confirm such things taking place. But what and why are we talking about 9/11 and prophesies here? This is a book about making your life more simple, is it not?! Originally I was thinking that I would pass this book along to one of you, in the spirit of the giveaway in which it was turned over to me. However, after I watched just a few of the "Glory of Zion" videos (in which one person implied that God is giving us His glory now, on this earth... totally ignoring the fact that God declares in Isaiah 42:8 that He will not give His glory to another!) I changed my mind. I think this book is a great example of why it is important to pay attention to who the author of any book is. What do they believe? What do they preach? Do they hold to the truth of scripture? Because if they don't, placing yourself under their teaching - even in book form - can prove to be a confusing and even dangerous thing. In summary, this: when it comes to tips on organization and simplification -- look elsewhere!!! Whoa, that sounds like a very disjointed book. Glad to read your discerning review; this is a book I'll not bother to read. Have you read Radical and David Platt's take on 'stuff'? This sounds....really weird. The book, I mean, or the latter half of it, not your commentary. I agree with you. Narnia-Girl - Yes. Read Radical and would recommend that one hands-down before this one! I had really been looking forward to your review. Quite frankly, I wonder if I slept through reading some of the book...(not uncommon with me and nonfiction)...if I still had the book I might be tempted to waste my time to reread it...but I'm glad I don't have it now. I was tempted to delete my review, but it was under a year old. Instead I edited it to send readers here. Just in case someone finds it. It sounds like one for the recycling bin. This seems like a time to put in a plug for my FAVORITE housekeeping book, "Keeping House: A Litany of Everyday Life" by Margaret Kim Peterson. She's a theologian and professor in Pennsylvania and doesn't talk about the HOW of housekeeping much at all. She talks about the WHY- by doing the chores of housekeeping, we keep our families (and others we minister to) from being cold, hungry and naked. The repetitive nature of housekeeping drives me batty (I am so NOT a housekeeper) but viewing it as a litany, a daily routine prayer/service, helps me. On a personal note, Peterson was widowed and her current husband uses a wheelchair, so she has juggled more than I have. Well, good to know, for sure! Thanks for your review. I read this book last year when it was first released and wasn't entirely sure what to make of it. I still have it on my shelf, but I think now would be an excellent time to clean out! "Glory of Zion"? That alone scares me off. SMB - I regret to tell you that I prefer peppermint ice cream. And so we have a problem. And you clearly just need to convert! Oh my! I didn't recognize Pierce's name, but once I looked them up, I understood exactly what you're saying. My experience with this particular movement (the intercessory/prophetic/end-times-happy branch of the charismatic movement) is right in line with what you described. Sermons with little defined shape. Scriptures pulled out of context. Inserting prophecy into the conversation with no apparent reason. Self-aggrandizement by self-proclaimed "prophets". Wow -- thanks for the heads-up. My life doesn't need this kind of "simplification." Thanks for the warning. Sounds like a "must miss". I read and reviewed this book when it first came out. Like you, I found some value in the first part and walked away confused by the second. It was a big bummer.